Lake Ashton features fantastic amenities including two impressive clubhouses and two 18-hole golf courses. 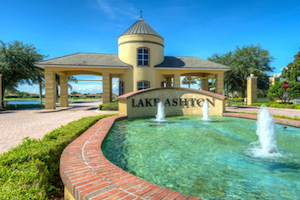 Surrounded by citrus groves, Lake Ashton offers resort-style living in beautiful Central Florida. This appealing community welcomes active adults aged 55 or better with lovely homes, scenic grounds and an exciting line-up of indoor and outdoor amenities. Overlooking a lake of the same name, Lake Ashton was opened in 2004 with plans for approximately 1,600 homes. The community is set in Lake Wales, Florida, and is being developed by CRF communities. Homes, which are currently available on both a resale and new construction basis, include both attached condo and single-family designs. At the heart of Lake Ashton, two spacious clubhouses bring residents together with a wide range of amenities, social clubs, special-interest groups and community events. The 26,000 square-foot main clubhouse includes hobby and game rooms, an arts and crafts studio, meeting rooms, a computer lab, a library, a golf pro shop, a demonstration kitchen and a full-service bar and restaurant. Residents can also enjoy a surround-sound, state-of-the-art theater, a four-lane bowling alley and a grand ballroom with a stage for a variety of events and live performances. 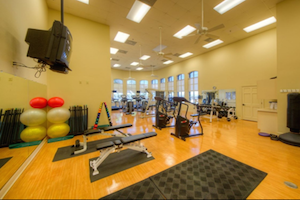 A state-of-the-art fitness center helps motivate Lake Ashton residents to exercise on a regular basis. Lake Ashton's 30,000 square-foot Health & Fitness Center provides additional amenities designed to support healthy living. The state-of-the-art fitness center offers cardiovascular and strength-training equipment, as well as an aerobics and dance studio. The facility also includes an indoor lap pool, walking track, racquetball courts and a basketball court. The resort-style amenities continue outdoors. Lake Ashton features two 18-hole championship golf courses, a driving range, two lighted tennis courts, two bocce ball courts, eight shuffleboard courts and horseshoe pits. Lake Ashton is ideal for water lovers, as lake access includes a boat launch, and the grounds also include parking for boats and RVs. Single-family homes in Lake Ashton include two collections: the Vacation Series and Motor Coach Homes. There is also a small collection of 20 condos, known as the Palms of Lake Ashton. These affordable condos have two or three bedrooms, one to two bathrooms and an attached one-car garage. Ranging in size from 1,302 to 2,521 square feet, single-family homes in the Vacation Series are designed with open floor plans and low-maintenance exteriors. They each include two or three bedrooms, two full bathrooms and two or two-and-a-half-car garages. Some also have separate dens. Single-family homes in the Motor Coach Homes collection are similar in size with floor plans ranging from 1,290 to 2,562 square feet. They typically include two or three bedrooms, two or three bathrooms and an attached two-car garage. Each model also features an attached RV garage. For active adults in Central Florida, Lake Ashton provides beautiful scenery, exciting amenities and homes designed for retirement living.